Exploring more than 80 of the world's most scientific theories and big ideas across the fields of physics, chemistry, biology, astronomy, geology, and maths, this book offers a fascinating look at the history of science. Discover how Galileo worked out his scientific theories of motion and inertia, why Isaac Newton gets the credit for them, and what the discovery of DNA meant. 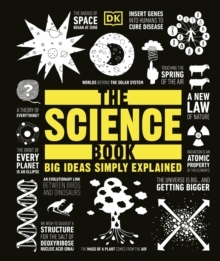 All the big scientific ideas are brought to life with quirky graphics, pithy quotes and step-by-step "mind maps" - from evolution and continental drift to black holes and genetic engineering - using eye-catching artworks to show how the ideas of famous scientists have affected our understanding of the world.